Sand Stupas, originally uploaded by c_p_lew. 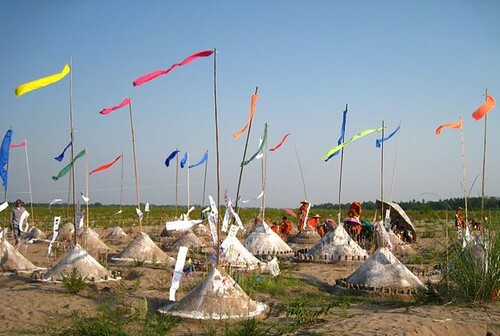 For Lao New Year, many communities organize building of sand stupas. Families and villages will get together to make these mounds, which are representations of Mt. Meru, the center of the Buddhist universe - the slopes of this mythical mound support the various levels of Buddhist heavens. After I returned from Xieng Khouang, I was walking around and met up with a friend of mine - his family had been there all day working on their mound. He looked a little sunstroked!